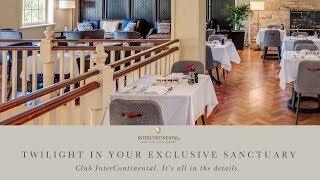 Club InterContinental Lounge is located within The Great House offering magnificent views overlooking the resort and includes: Gourmet breakfast daily, all day light refreshments, afternoon tea, twilight drinks and canapes and more offerings. Please note for twilight evening drinks and canapés this is only on offer for guests 18 years and over. With views across the garden and rolling golf greens these classic 67 square metre suites offer a little more space and can be interconnecting with king or twin rooms. Separate dining and living space are perfect for families and feature two furnished balconies. Capture the pinnacle of opulence with the luxurious Federation Suite and discover a private retreat with your own terrace balcony overlooking the one-acre beach lagoon pool, manicured gardens and marina. With 178 square metres of stylish décor and stunning open-plan living, the Suite is an entertainer’s dream with its own fully-equipped kitchen, sitting area, dining area and cosy lounge room. For ultimate comfort, the Suite is complete with a master bedroom with timber-sleigh bedding and your very own spa with luxury amenities. 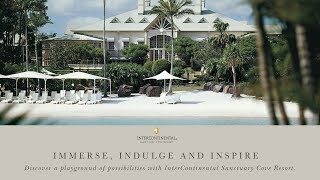 Club InterContinental access is also included with the Federation Suite, opening you up to a world of premium inclusions from Club lounge access to complimentary breakfast and twilight drinks and canapés. Open the door to the Resort’s royal suite and welcome the opulence of our Manor. Designed with lavish style and comfort in mind, this iconic Suite is set upon an impressive 230 square metres and features three private balconies giving you unrivalled access across 4.2 hectares of Resort grounds – from the Fountain Terrace and beach lagoon pool to the manicured gardens and marina. The Manor Suite is the darling of entertaining with its dramatic 10-seated dining table, fully-equipped bar and pantry areas, separate sitting area and a large separate lounge room with fireplace. The large bedroom is complete with a four-poster king bed and luxury amenities. To complete the InterContinental experience, the over-sized bathroom features a soaking bath, separate shower and your very own spa for the ultimate relaxation. For the ultimate resort experience, enjoy Club InterContinental Marina Rooms with marina views offering gracious decor reflecting a classic homestead style 39 square metre room, including plantation shutters opening onto a furnished private balcony with Inviting solid timber sleigh-beds adorned with crisp white linen. All spaciously appointed Club InterContinental rooms feature a bathroom with a deep bathtub and separate shower with polished wooden parquetry floors along with access to Club InterContinental. Enjoy lush garden or manicured golf course views offering gracious decor reflecting a classic homestead style 37 square metre room, with inviting solid timber sleigh-beds adorned with crisp white linen. All spaciously appointed garden view rooms feature a bathroom with a deep bathtub and separate shower, polished wooden parquetry floors and sliding shutters that open onto a furnished balcony. 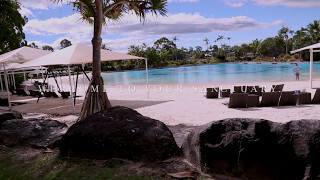 From the furnished balcony take in luxurious water views from the beautiful beach lagoon pool to the Coomera River. Gracious décor reflecting a classic homestead style 37 square metre room, inviting solid timber sleigh-beds adorned with crisp white linen are spacious and feature a bathroom with a deep bathtub and separate shower, polished wooden parquetry floors and sliding shutters. With views across the garden, golf, marina and lagoon these spaciously appointed 66 square metre Queenslander Suites feature separate dining area, bathroom with a deep bathtub and separate shower, polished wooden parquetry floors and sliding shutters that open onto a furnished balcony. Queenslander Suites also interconnect with twin rooms.